I remember how excited I was to plan Libby’s first birthday. It’s hard to believe her second birthday will be coming up soon. I am sure you are wondering where the time went. The days begin to blur and suddenly nighttime feedings got fewer and far in between. Your “baby” is beginning to look like a little toddler. Now, here you are, starting to prepare for his or her first birthday. 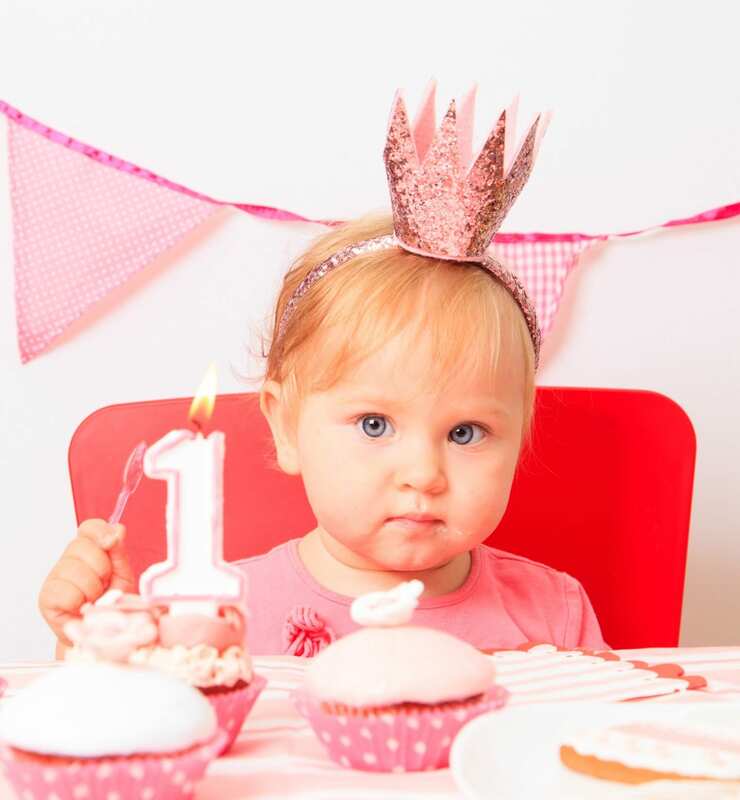 I put together this ultimate guide to planning a first birthday party to help you with all the tiny details. 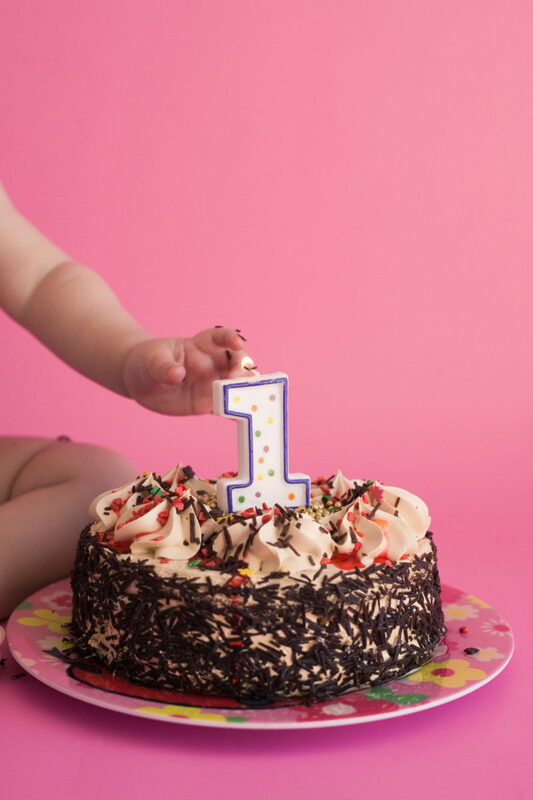 Not only are you celebrating the birth of your child, but you are celebrating the last year of milestones. A first birthday is a celebration for the whole family. Babies have a way of bringing families together. 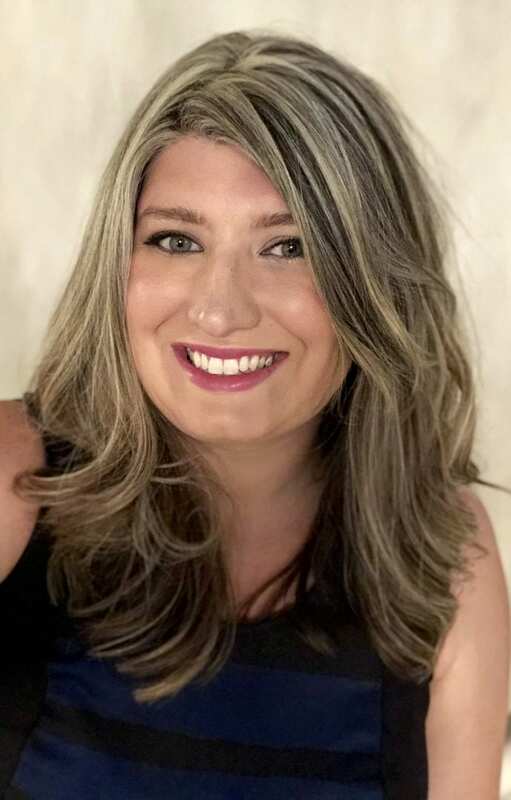 Simply by being born they create new roles in the lives of people we are closest to; Aunt, Uncle, Grandma, Grandpa, Sister, Brother, maybe even for your first time, the new role as Mom & Dad. Enjoy the process of planning a party for your little darling and the people closest in your lives. 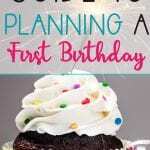 Let’s get started on the Ultimate Guide to Planning a First Birthday Party. *This article does include affiliate links. Throughout you will see some of my favorite finds on Amazon for a first birthday. We receive a commission for any items purchased, but at no additional cost to you. To start the planning process, there are four things that need to be decided: budget, guest list, venue, and theme. These party priorities will help you set specific party perimeters. After you tackle these four things, all the rest will fall into place. 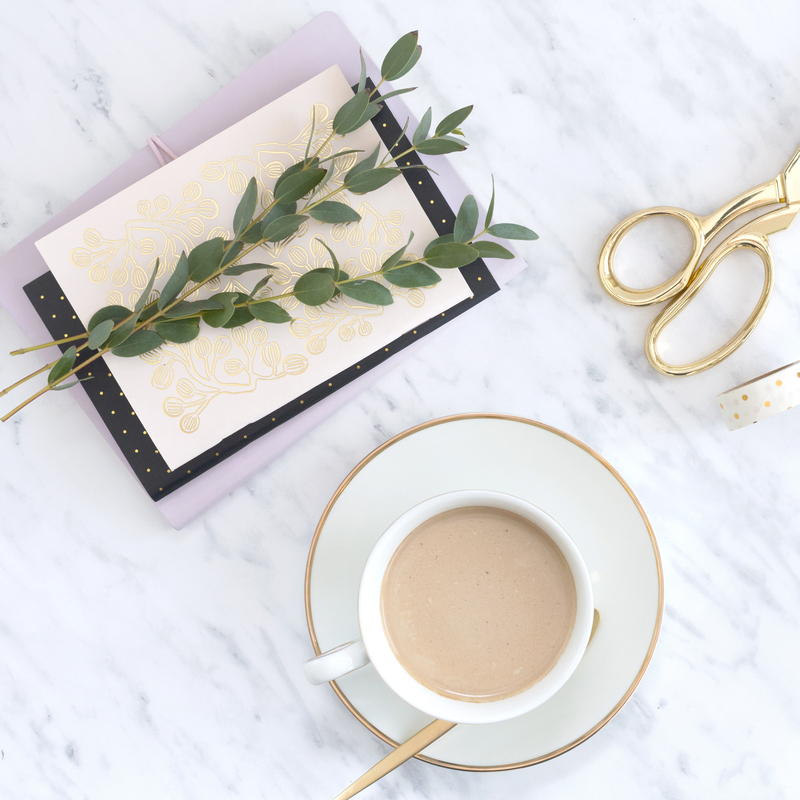 If you have a large or unlimited budget, then you will have more flexibility to invite as many people as you want, as well as the resources to book a venue to hold your guests. If you are working on a smaller budget, you might look at hosting it at your home. This may require a smaller guest list to comfortably accommodate all of your party goers. You can either choose a theme to fit your venue (i.e. you rent a pool at a local gym and choose an Under the Sea Party), or pick a theme and then choose your venue (i.e. you pick a Pink Princess Party and decorate a venue accordingly). There is lots of flexibility with choosing your theme. If you can’t settle on a theme you want right away, don’t worry. Instead, opt for sending out a neutral invitation. A pink or blue invitation would be lovely, or even better, an invitation with your son or daughter’s photo. Your guests will still enjoy every bit of the fun when they arrive and see your theme come together. 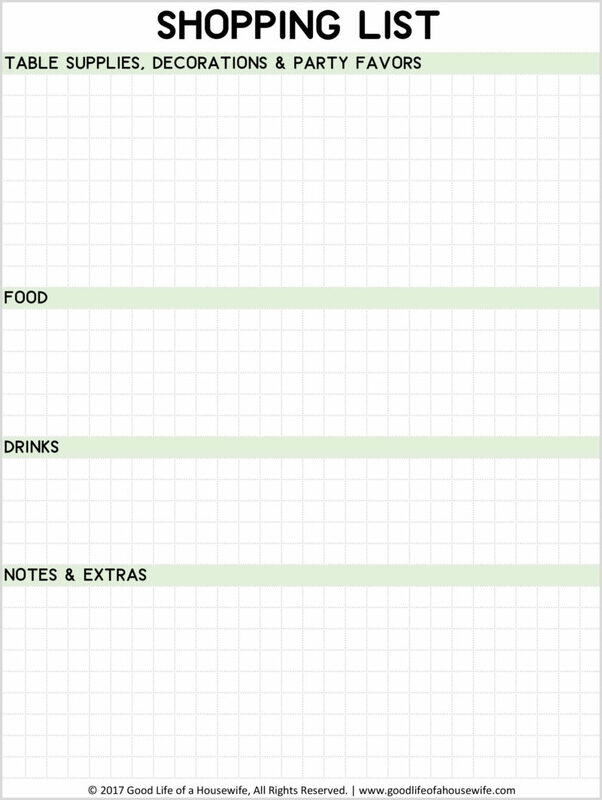 A budget friendly option is to choose a theme based on the time of the year, and season. For instance, a Fall baby may have a party centered around pumpkins, leaves, apples, Halloween, Thanksgiving, etc. You may find you already have seasonal decorations on hand. 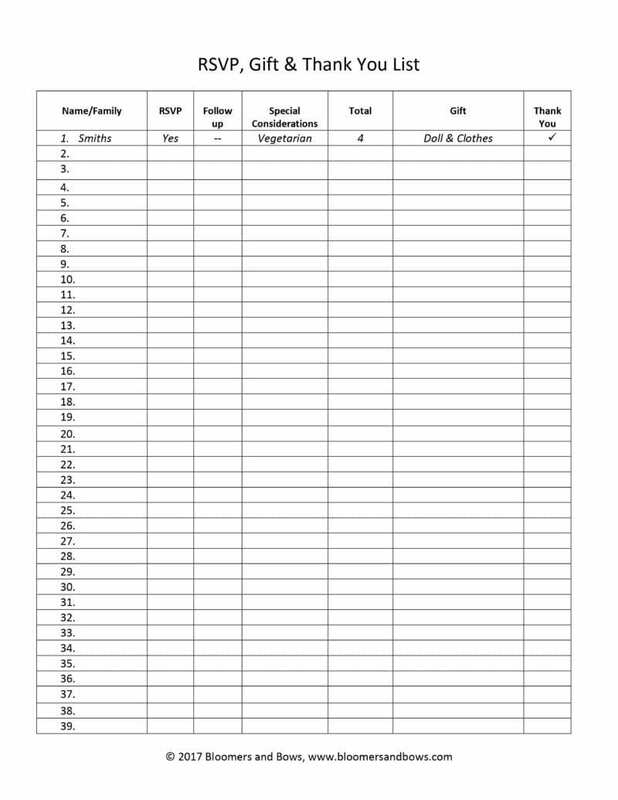 Additionally, for a menu, it’s usually more cost affective to buy food items that are in season. Decorating sets the tone of the party. There are dozens of items to really make your daughter’s first birthday party memorable. Websites like Amazon Handmade and Etsy have thousands of options for customized goods that you can print or order already made. You can have everything from water bottle labels, to matching food tents. Keep in mind, printables take time to produce and send, and they take time to assemble. Order anything for the party a few weeks in advance. Do any assembly (folding, cutting, taping…) a few days/weeks prior to the party. These things always take more time the you expect, and you will have enough to do the day before and day of the party. 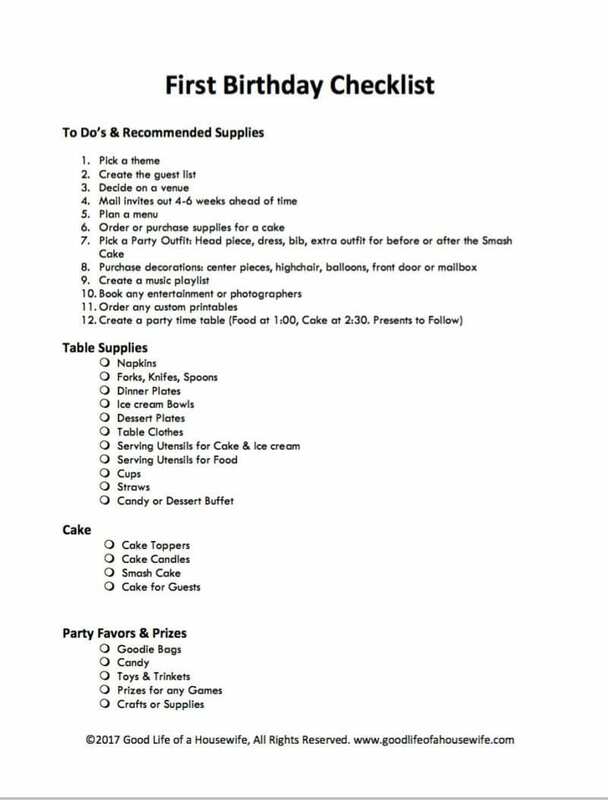 Here are some free checklists and planning documents to help you stay organized when planning your party. Don’t forget older kids and other toddlers that may be at the party. Put together goodie bags and small finger foods that are age appropriate. Be sure to charge your phone and any camera batteries. Make sure you have enough space for lots of new memories and videos. Locate a friend of family to take pictures/videos for when your baby eats the smash cake.